Enable Twitter Access: If you define Twitter as a news channel, you must have a twitter account. (You can acquire one for free at twitter.com.). 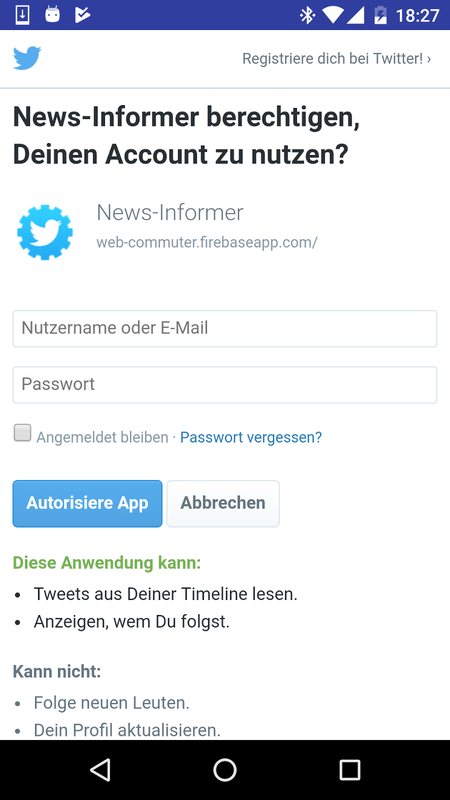 You must grant this app the right to receive twitter news with your account. The following web-page from twitter will appear. 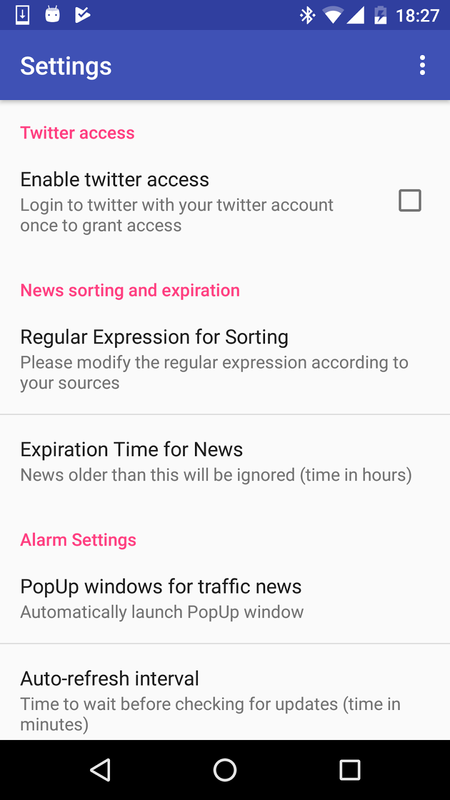 Type yes, and enable this app to receive twitter news. 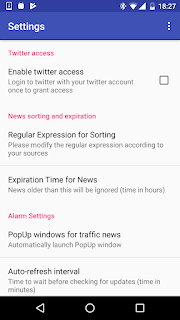 Regular Expressions for sorting: Your news items are show as a list on the main page. You can configure, if they are sorted according their date, their source, the read/unread state or in alphabetical order. However, you might be interested in an order according to the names of the highways, which you are monitoring. (So, all messages concerning R66 should be listed before the messages belonging to R68, etc.). You, you might be interested in an order according to a search term like "R66" or "R68" or "R??". You can specify such a search term for sorting by using a regular expression. (See here for more info). The regular expression for our example would be "R[0-9][0-9]", so that each news item containing a letter "R" followed by two numbers would be listed first. If there are more news items, matching this pattern, they are sorted by their search term in alphabetical order. Expiration time for news: You can define, how old messages can be at maximum, before they are ignored. So, relevant messages older than 24h are ignored by default, as it is very likely that conditions have changed since then. You can set this value higher or lower as you want. PopUp Window for traffic news: Here you can specify, weather a Window should popup if there are new news items. You can specify, if this PopUp window only appears, if ACom is running in foreground or if the PopUp should appear even if you have left ACom and another app (e.g. Navigation App) is in foreground. However, to use this feature, you must enable AutoRefesh by clicking the button "Auto" (set to "Auto On") on the news main page. Auto-refresh interval: If you enable Autorefresh, you can specify the interval after the news channels are scanned again. If you set this interval too small, your battery drains faster, if you set the interval too large, news might not by as actual as you want. Enable Text-To-Speech: You can enable TTS, so that messages in the PopUp Windows are read by the app and you can focus on driving without the need to look on the device during driving. In the menu, you have to select the language in which the news are to be read. However, to have an effect, you must activate "Automatic read (TTS) news messages", too. Automatic read news messages: Here, you enable TTS. However, you must have set the correct language before in "Enable Text-To-Speech". Remember: This will only have an effect if you have enabled "PopUp windows for traffic news" - without any PopUp Window, there is nothing which can be read by the app.